This adapter is used to program the JTAG, SPI and PIC chip in circuit, such as computer motherboard BIOS upgrade without remove the chip from motherboard. There are many factors affect the ISP programming. The main issue is the poor signal quality since many circuit is not designed for the in-circuit-programming originally. The poor signal quality will cause the in-circuit-programming unstable and fail. The adapter is deigned for enhancing the signal quality when doing in-circuit-programming. 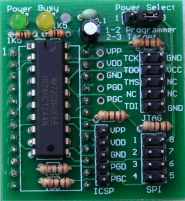 It has a signal driver chip to make in-circuit-programming signal in better quality and programming stable. So that to increase the programming success rate. 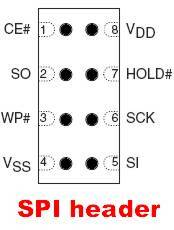 It works on any programmer for SPI chip programming. It works on GQ-4X for JTAG, SPI and PIC chip ICSP programming.. It works on GQ-3X for SPI and PIC chip ICSP programming. Application example: motherboard upgrading for BIOS chip 25VF080. With this adapter, the in circuit programming will be much easier.